New Sweets Test Boundaries; D’Anjou Pear, Açai or Beef Jerky? Is chocolate better with bacon? That’s what candy companies are betting on, as they put adventurous new flavors into chocolate and confections to satisfy the increasingly sophisticated sweet tooth of their young customers. Long limited to small manufacturers and specialty stores, novelty candy is now whetting mass-market appetites as well. Target sold out of Pumpkin Spice M&Ms, a new flavor made exclusively for the discount retailer, a week ahead of Halloween. The retailer said the product sold faster than expected. Walgreens put Wild Ophelia chocolate bars with funky flavor combinations—beef jerky, BBQ potato chip, New Orleans chili and peanut butter and banana—into 5,000 of its stores in September. Made by Vosges Haut-Chocolat Ltd., a Chicago-based company, the Wild Ophelia brand was launched last year to take unconventional chocolate from its artisanal niche to the mass market. At Walgreens, the brand is sharing space with old favorites, such as Hershey ‘s Kisses and Milky Way bars, but also foreign fare like Panda blueberry licorice from Finland and Ritter Sport chocolate from Germany. Walgreens’ own brand, Good & Delish, also includes uncommon varieties, such as Cashew Crisps made with milk chocolate and salty cashew nuts. After Halloween, Target will offer another M&M exclusive, white chocolate peppermint. “Pumpkin is big in general right now,” says Rachael Vegas, Target’s vice president for grocery. Ms. Vegas predicts bacon and coconut will also be popular flavors over the holiday. Wal-Mart Stores Inc. will sell its own range of gingerbread M&Ms, to follow the orange M&Ms it sold exclusively for the holidays last year. Mars Inc., the maker of M&Ms, declined to comment. What Does Halloween Candy Really Do to Kids? More parents are devising tricks to get the Halloween treats back from their children amid worries over daily sugar intake. Bonnie Rochman joins Lunch Break with a look at what candy really does to children, and what parents can do about it. Photo: Getty Images. This Halloween, Americans are expected to spend $2.08 billion on candy, according to the National Retail Federation. 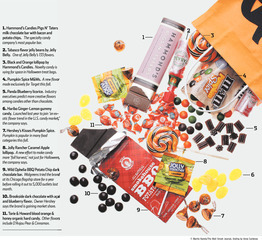 Trendy candy is vying for space in the treat bag, even though trick-or-treaters can still expect more standard fare. Halloween represents the biggest candy-buying period of the year, and 74% of U.S. households plan to hand out candy this year, according to the National Confectioners Association. Retailers say they divide autumn in two—early fall, when consumers get in the mood for the new season and fill their candy bowls at home with new and increasingly, interesting, products—and Halloween, where quantity still rules over quality and creativity. Americans spent $23 billion on candy this year through Oct. 6, according to Information Resources Inc., a Chicago-based market research firm. (The figure doesn’t include specialty stores.) Sales of all candy excluding gum grew by about 4% over the same period last year, driven by higher prices, wider distribution and new products, including those with exotic flavors. Once-upscale varieties, such as dark chocolate and salted caramel, now have permanent places in U.S. candy aisles. Jelly Belly Candy Co. makes 133 kinds of jelly beans, up from 50 in the 1990s. Some varieties, such as the year-old Tabasco flavor, are aimed at adults, but there are also unusual varieties for kids, such as juicy pear and chocolate pudding. Others were inspired by foreign countries. The chili-mango flavor, for instance, was initially developed for the South American market but now also sells in the U.S., says Rob Swaigen, Jelly Belly’s vice president for marketing. 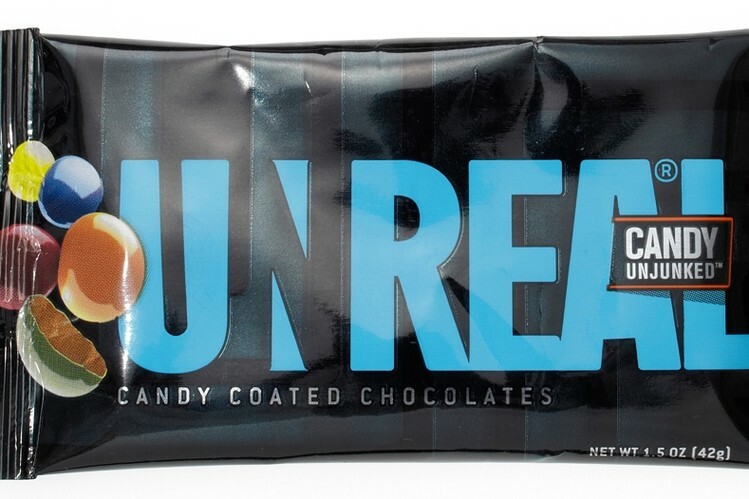 Candy companies are capitalizing on the growing spirit of adventure. German sweets maker Haribo introduced Ginger-Lemon gummy candy in the U.S. last year. For this fall, Hershey Co. updated its Jolly Rancher caramel lollipops by infusing them with an apple flavor. In January, Hershey plans to introduce its first new brand in 30 years: a caramel cream confectionery called Lancaster that will come in three flavors, including a combination of vanilla and raspberry. The company says its Brookside brand, which pairs dark chocolate with exotic fruit juices, such as açai and goji, is gaining market share in large retail chains and is now rolling out in convenience stores. As candy-makers push flavor boundaries, industry experts say they must ensure that products are actually tasty. “Unlike when we were growing up, companies can’t just call it watermelon if it doesn’t taste like watermelon,” says Bruce Good, vice president at Good Marketing, a consulting and new product development firm in Cleveland. Torie Burke, co-founder of Torie & Howard, a producer of organic hard candy in New Milford, Conn., says she and her partner, Howard Slatkin, tested 40 flavor combinations, including tomato and basil, and strawberry and black pepper, before settling on four. Ms. Burke said she was surprised that kids like the brand’s D’Anjou Pear & Cinnamon flavor, which is less sweet than other hard candy. The product was inspired by a pear tart Mr. Slatkin used to bake, but it took a year of testing to balance the flavors of ripe pear, slightly sweet syrup and Ceylon cinnamon. “A lot of candy is way too sweet,” says Ian Thomas Brackney, a 12-year-old from Chicago, who is a fan of Butterfinger and 3 Musketeers bars, but generally prefers what he calls “adult candy.” He liked the Torie & Howard’s pear and cinnamon candy, which his mom, Dianne, recently brought home from Whole Foods . Max Rains, a sixth-grader from Chicago, is an adventurous eater. He likes artichokes, sushi and dark chocolate. His latest discovery is white chocolate with lemon zest and pink peppercorns, made by Vosges. “I wasn’t sure I’d like that, but it was really good,” says Max, who is 11 and plans to dress up as Abraham Lincoln on Halloween. Novelty items don’t necessarily displace other brands on store shelves because the merchandise mix tends to change fairly frequently anyway, candy makers say. They sell, for example, seasonal and limited-edition products, as well as products tied to a movie or other big event. For inspiration, they are studying foods such as potato chips, which now come in flavors from Parmesan to vindaloo, and in healthier offshoots, such as kale and parsnip chips. One food trend currently hitting candy is comfort food: the Peanut Butter & Jelly Sandwich chocolate bar made by American Gourmet Group, and Pigs N’ Taters—a mix of milk chocolate, potato chips and bacon by Denver-based Hammond’s Candies.